Before you can head for the total home comfort hills, you need to find a dedicated HVAC company you can trust to guide you in the right direction. As a Rancho Bernardo resident, you’re in luck. There’s no team more committed to your home comfort than Mauzy Heating, Air & Solar. From our dependable heating services to our distinguished cooling services to our innovative solar systems, our company offers the variety of HVAC services you need to achieve the complete contentment you deserve. Though California remains on the warmer side for the majority of the year, residents still encounter cooler weather throughout the winter months. So it’s crucial that your home includes both an air conditioner and a heater. But the trick is to find the right system. Luckily, Mauzy’s team is here to help Rancho Bernardo, CA, residents with this task. Our HVAC contractors will examine your home’s layout and your specific comfort requirements to find the air conditioning and heating system that fits your home (and your contentment needs) perfectly. From a furnace installation to an air conditioner installation, you can count on Mauzy’s team to install your system flawlessly the first time around. Even though HVAC systems are durable, they are not indestructible. 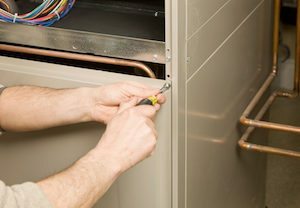 So, from a heating system repair in Rancho Bernardo, CA, to an air conditioning repair in Rancho Bernardo, CA, you can rely on Mauzy’s technicians to provide your system with the efficient solution it needs to restore your comfort before you even notice it’s gone. It’s important to understand that the quicker you catch a repair, the less likely it is for a small unit problem to turn into a bigger and more costly calamity. So, from a minor system hiccup to a major repair, Mauzy’s consistently quick response to repair your system will lengthen your unit’s lifespan, eliminate high-energy bills and protect your budget from complete disaster. There’s only one way to prevent the wellbeing of your system from going downhill and that is to provide it with the TLC it needs. In fact, from seasonal system maintenance to frequent unit checkups, the more care your heating or cooling system receives, the less likely you are to encounter costly repairs. And, maintaining your unit’s wellbeing allows for more efficient operation. This not only saves you money, but it increases your system’s energy proficiency and extends your unit’s lifespan, too. Over the last four decades, Mauzy’s team has been Rancho Bernardo’s preferred choice for system maintenance services. That’s because no one is as equipped as our team to clean, inspect and replace your system’s parts. So contact Mauzy today for a more efficient system tomorrow. Instead of relying on the electrical company to power your home, choose the more affordable route. That is to turn over your energy needs to the sun. Through our solar services, Mauzy’s solar contractors will install a solar energy system that radiates savings right away. It’s time to take your home comfort into your hands by trusting it in ours. For more information on how our heating, air conditioning and solar energy services can be beneficial for your Rancho Bernardo home, fill out our online form or call us at 858.900.3909 today!